Vitamix blenders are famous for their high power, but what does that power actually mean, and do they deliver the horsepower that Vitamix claims? My goal here is to explain what power means in the context of a blender and then to describe my independent measurements of Vitamix horsepower (including both input and output). I am mainly motivated by general curiosity, but there is a practical application that relates to how fast a Vitamix blender can heat soup. Beyond that, blending is more complicated than just power, so I will not be trying to draw conclusions about performance. This post is a bit technical, but I will try to explain it as straightforwardly as possible. If anything is unclear or confusing, please don’t hesitate to ask questions, either by commenting below or contacting me directly. 8 Can a Vitamix blender boil water? 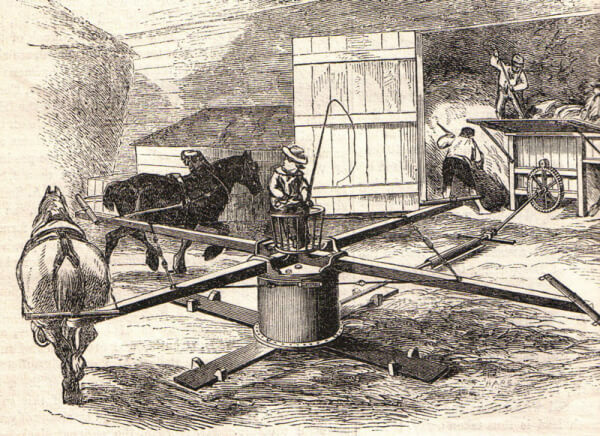 The concept of horsepower has been used for marketing since the 18th century. It invokes an intuitive picture of harnessing the work of powerful horses. 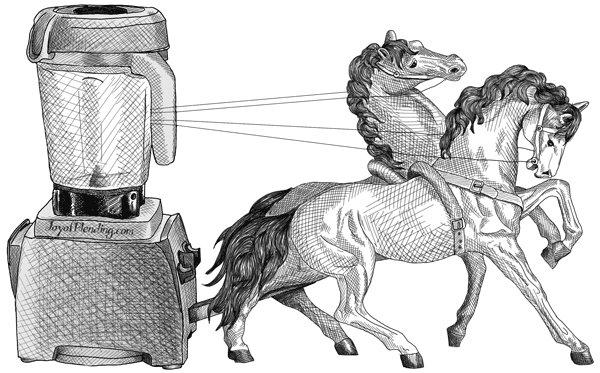 Vitamix advertises their machines as having a ~2 peak output horsepower motor, which brings to mind the power of two horses tromping around, maybe something like this: The definition of power is the rate of doing work, and work is defined as exerting a force over a distance. 1 horsepower is defined as the power that would lift 550 lbs 1 foot in 1 second. Indeed, in the early days, horsepower was used to describe how many draft horses a steam engine could replace. 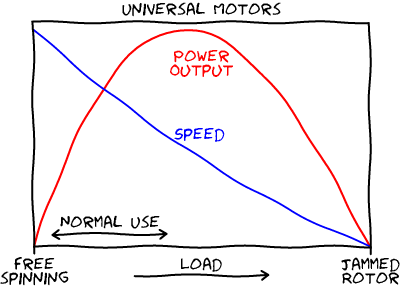 Both the horsepower and the rotational speed depend on the load on the motor. In a blender, the load depends on the quantity and consistency of ingredients being blended. (Larger volumes and/or thicker consistency increases load.) So, unlike something like a light bulb that always draws the same amount of power, blender power is a bit more complicated. Note that there are different ways that power can be used to characterize a motor. First, there is a difference between the input electrical power, which comes from the wall socket, and the motor’s mechanical power output. The difference between input and output power is determined by the motor’s efficiency, which can range from 30–75% for universal motors. Some manufacturers state their blender’s horsepower using the input number, whereas Vitamix states horsepower as the output. What load is Vitamix using for their power input rating? Vitamix machines are UL listed (you can find the little UL symbol on the back or bottom of Vitamix machines), which means that they have been certified by UL LLC (a certification company that maintains safety standards for all sorts of products). UL 982 is a published standard that includes details about the requirements of an input power rating. It specifies that the benchmark load is “a mixture of diced carrots and water in the ratio of 2 to 3 by weight . . . to the marked capacity of the container . . . recorded 30 seconds after the first load cycle begins.” However, the UL standard also says that for appliances over 2.6 amps, the rated input power can have a ±15% deviation from the measured load test. The standard gives a benchmark load, but it also shows that manufacturers have quite a bit of leeway in their input power specification! I used a Kill-A-Watt electricity meter to measure the input power when blending the UL-982-prescribed carrot-water mixture in the Vitamix 7500 with the wide 64-oz container. I measured 11.35 amps at 118 volts, and 1240 watts (note that the watts measurement is slightly less than V∗A because here the power factor is 0.93; VA is 1340). Those readings are well within the ±15% of Vitamix’s power rating of 12 amps. So, that’s the input power, what about the power output? This is a classic principle of thermodynamics, and it is actually almost the same setup that James Joule used to demonstrate the equivalence of work and heat in the 19th century. 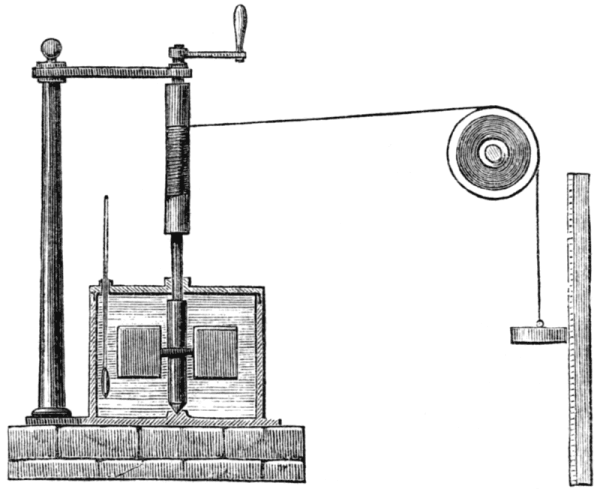 Here is an engraving showing his apparatus: As the weight on the right falls, it pulls a string, which turns paddles in a tank of water, and a thermometer measures the change in temperature of the water. It turns out that a similar setup is called a water brake, and it is used for measuring things like race car engines. A blender has a built-in water brake that we can use to measure power! I used a Vitamix 7500 for these tests, but I’ve previously found that all of the full-size Vitamix motors (C and G-Series) perform identically at maximum speed once they are loaded, so these results should apply to any full-size Vitamix. I was curious if I could measure the peak output horsepower, and to do that I needed a higher load. I decided to try a thick sugar syrup made from granulated sugar (sucrose). I found a handy formula for estimating the specific heat of sugar solutions. First I tried 67%, but that wasn’t thick enough, so I increased to 73% (that’s percentage by mass, so 73% is 73 g sugar per 27 g water). The viscosity is highly temperature dependent (it gets thicker the colder it is), which turned out to be useful for these measurements. I cooled the syrup in the fridge, and then made a series of 10-second heating measurements, allowing the motor to cool in between. The high load means that the current draw is extremely high. I managed to both trip a circuit breaker in my power strip and set off the thermal override in the motor (on separate measurements). I was satisfied to find a peak in the output power. That is, as the syrup warmed and its viscosity decreased, the output power first increased, and then decreased. The greatest output I measured occurred at 64°F and was 1.9 horsepower, with an input of 2050 watts (~69% efficient). The motor was able to keep this up without overheating for the 10 seconds that it took to make the measurement. I did not make too many measurements because it was too easy to overheat the motor with extended periods of these high loads. I likely missed the true peak by a little, but this was close enough to the claimed horsepower to satisfy me. Note that these measurements also disregard the power used by the cooling fan. In order to make these measurements, I used a situation with a nearly constant load (and known heat capacity). Of course, in many practical blending applications the load is highly variable, and I believe there are situations where the motor outputs peak power that do not involve blending 64 oz of thick syrup. Since power is the product of torque and rotation speed, we can also calculate the output torque. (I measured the speed using sound.) The 64 oz of water was spinning at 15,800 RPM yielding 0.4 ft⋅lb, and the 64 oz of syrup at peak power was spinning at 7,600 RPM, yielding 1.3 ft⋅lb. Can a Vitamix blender boil water? Larger amounts of water take longer to boil, although if you double the water, the time is less than double because more water increases the load, which means the motor puts out more power. Note that thicker soups heat faster because they increase the load. 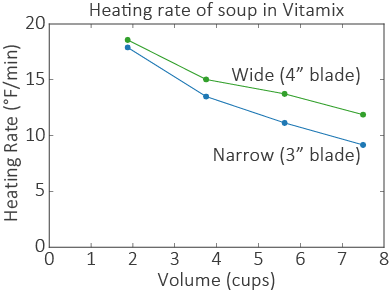 I’ve seen some sources say that a Vitamix will heat soup to a certain temperature, but actually the final temperature depends on all of these variables: blending time, volume, thickness/viscosity, and starting temperature. Both the input and output power of a blender depend on what is being blended. Within the range of normal operating conditions, increasing the load, by increasing the volume or thickness of the ingredients, increases the power input and output. The power output of the motor gets converted into heating the ingredients, which can be used to heat soup or, as we have seen, to measure the power output. I measured ~1.9 peak output horsepower—well within the ballpark of Vitamix’s stated horsepower, given that this was not a precise measurement. Top illustration drawn by Ana Garro. Horse mill illustration from The Illustrated Exhibitor 1851, via Wikimedia. Joule’s apparatus illustration from Harpers Magazine, via Wikimedia. Q: What about losing heat to the environment? A: I made these measurements within 10°F of ambient temperature, where the rate of heat loss to the environment is negligible compared to the heating rates. 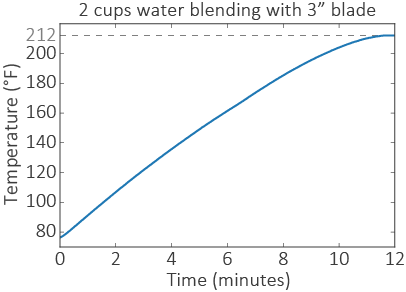 The rate of heat flow is proportional to the temperature difference; you can see it start to be significant at the elevated temperatures of the boiling water plot (although the heating rate also decreases because the viscosity decreases with increasing temperature). Q: What about heat from heating of the motor itself? A: The motor does heat up quite a bit, and it is cooled by air drawn through the housing by a fan below the motor. The drive shaft does not conduct any appreciable amount heat. A section of the drive shaft is plastic (a poor thermal conductor), which is designed to break if the blades are overloaded (it is replaceable). Q: What about heating in the bearings? A: Yes, some of the motor’s power gets taken up by friction in the bearings, which heats them up. This is why you shouldn’t grind flour for longer than a minute: flour is not very thermally conductive, so heat from the bearings does not dissipate, and they can overheat. To test the amount of heat I ran the motor at maximum speed with an empty container for 30 seconds, then poured enough water in to cover the blades, and measured the change in temperature of the water. It was measurable (250 g water increased 2.3°C), but insignificant compared to the amount of heating that I measured in the power tests (less than 1%). This is a great explanation of why thick, viscous soups heat up faster than thin, watery ones—all that friction gets captured and muffled into heat. My eyes glazed over like it was high school honors physics all over again. How does the S-Series fit into all this? I haven’t made this sort of detailed measurements of the S-Series. However, when I reviewed the S30 I did some rough measurements of how fast it heated soup. It heated about 35% slower than the full-size machines (it took ~50% longer to get to the same temperature). Part of that is due to the shorter blade, and part of it is due to the smaller motor. Bravo! You are quite an artist, and an engineer/scientist, and a writer! I continue to refer my friends to go on your site. Thank you for your support! But, to be clear, I commissioned the top illustration. I designed it, but I did not draw it. Can I use the 2 Liter Jar from the G series on my vitamix Prep 3 Commercial? 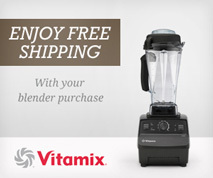 Vitamix is not recommending it, perhaps they want to sell new units. Anyway, Amazon sells the one that most closely represents what I’m looking for: QVS 16″ 3-Prong OutletSaver Splitter Power Adapter. I found your website when trying to figure out the max amperage used by my Vitamix (I believe the housing says it uses up to 13amps but that appears to be the absolute maximum power usage). Here’s my question. This particular splitter (90° straight down) is a 16 gauge and, judging from what I’ve found online, maxes out at about 10 amps. Do you have any sense of the risk I’d be taking for using this splitter with my Vitamix? Does a few minutes of overdrawing current create any true risk of fire or failure? If so, I don’t want to even push my luck. If in the real-world, the likelihood of having issues is miniscule, I might spring for the adapter. Thanks again for any help. As mentioned in this post, in high-load situations, a Vitamix can draw well over its rated 12 amps. I’ve seen them draw up to ~18 amps. 12 amp is for a full 64-oz pitcher of a blend slightly thicker than water. The power depends on thickness and volume. For smaller smoothies, the draw can easily be under 10 amps. It’s also true that shorter run times should lower the risk compared to an an appliance that is on for more extended periods. But again, I’m not going to evaluate that risk for you.